Muharem Kianieff joined the Faculty in August 2008. His research interests include Corporate / Commercial Law, Banking and Negotiable Instruments, Payment Systems, Electronic Commerce, Consumer Protection, Law and Economics, and Public Policy Formation in Canada. 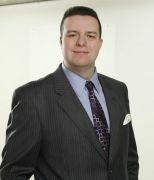 Dr. Kianieff has previously attended Trent University where he completed an honours degree in political science / economics and graduated with the J.J. Robinette Scholarship. He then received his legal education from Osgoode Hall Law School. Following this, he returned to Osgoode for graduate school where he won the Harley D. Hallett Graduate Scholarship on three occasions and served as the Acting Book Review Editor of the Banking and Finance Law Review.